Beer. Introduction. Legal definitions. The beer market and beer consumption. Production methods. Composition and properties of beer. Conclusion. Acknowledgements. References. Alcohol-free beers and low alcohol beers. Introduction. Legal aspects. Production methods. Conclusion. References. Coolers. Introduction. Legal definition. The market: consumption. Production methods. Quality control. Shelf life. Properties of the beverage. Target consumers. References. Index. 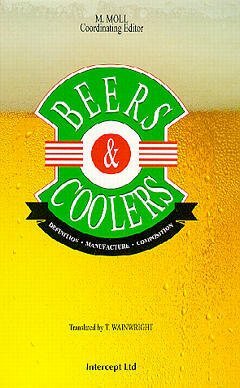 This book puts into perspective the most recent information on beer, including beers containing little or no alcohol, and on coolers, both beer and wine. The number of subjects which have an impact on brewing is continuously increasing (agronomy, plant and microbial genetics, molecular biology, immunochemistry, biochemical engineering, chemical and process engineering, microbiology, inorganic physical, organic and analytic chemistry, biochemistry, physiology, nutrition, toxicology, legislation) and this book contains all the relevant facts about legal definitions, sales, consumption, production methods, compostions and properties, etc.